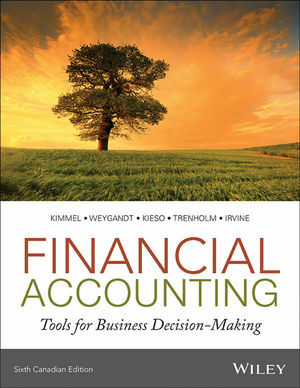 Financial Accounting Sixth Canadian Edition and its supplement package is the only product that can deliver a unique balanced procedural and conceptual (user-oriented) approach, with a proven pedagogy and a breadth of problem material in an engaging manner giving students the opportunity to “get accounting” by “doing accounting”. The authors’ worked tirelessly to create materials that engage students in the learning process, help them learn to learn, and at the same time bring to their attention the most current coverage of both sets of rapidly changing accounting standards, IFRS and ASPE. NEW! The sixth edition was subject to an overall, comprehensive revision to ensure that it is technically accurate, relevant, and up-to-date. End of chapter materials has been carefully reviewed and revamped. New companies used in Financial Reporting and Comparative Analysis problems (companies which are more familiar to students thus making the text more student-friendly). More cases added to each chapter. We’ve restructured our Broadening Your Perspective section. NEW to this edition in this section are critical thinking cases written by Wayne Irvine. NEW Camtasia problem walkthroughs showing students step by step solutions, including what works and what doesn’t. This is like having the professor by your side. NEW QR bar code added to Self-Test Question section to take students to additional practice opportunities on any mobile device. WileyPLUS is a research-based online environment for effective teaching and learning. WileyPLUS is packed with interactive study tools and resources–including the complete online textbook–to give your students more value for their money. With WileyPLUS, with Kimmel students will get accounting by doing accounting.